Doras Luimní has long advocated for effective access to the labour market for people seeking asylum in Ireland. From 1999 to 2018, people seeking asylum were not allowed to seek or enter employment. On 2nd July 2018, the EU (recast) Reception Conditions Directive was transposed into Irish law. Ireland has now introduced new provisions to facilitate access to the labour market for eligible international protection applicants. Access to the labour market is limited to people who have not received a first instance recommendation within 9 months. The decision to opt-in to the Reception Conditions Directive followed a Supreme Court declaration, in February 2018, that Ireland’s ban on employment was unconstitutional. The Supreme Court case was taken by a Burmese national who had spent eight years living in Direct Provision. See the timeline below for more details on the case and the Government’s response. The Court has been adjourned for six months (from May 2017) to allow the legislature time to respond. Six months after the Supreme Court ruling, the Government returned to court to outline the response to the judgement. The Government committed to opting-in to the EU (recast) Reception Conditions Directive, which sets out minimum conditions for asylum seekers, including access to the labour market no later than nine months after an initial asylum application. No further detail on the right to work for asylum seekers has been release d but the Government has indicated that there will likely be restrictions placed on the categories in which asylum seekers may work. On 9th February 2018, the Supreme Court will declare Ireland’s ban on employment to be unconstitutional at which point Ireland will need to introduce measures facilitating the right to work. Opting-in to the EU Directive could take upwards of four months from the time of initiating the process with the EU Commission. The Supreme Court has declared Ireland’s ban on employment to be unconstitutional. From 9th February 2018, asylum seekers are now permitted to apply for an employment permit as part of the interim measures introduced by Government, while it is opting-in to the EU (recast) Reception Conditions Directive. The employment permit process is very restrictive and requires people to have secured employment in restricted sectors with a salary of a minimum of €30,000 per year. The Government has indicated that it will introduce less restrictive measures when opting-in to the Directive later this year. No detail on the proposed arrangements have yet been published. Ireland transposes the long-awaited EU (recast) Reception Conditions Directive into Irish law. From 2nd July, eligible asylum seekers can apply to INIS for permission to seek employment. Eligibility for permission to seek employment is limited to applicants for international protection have not received a first instance recommendation within 9 months. For full eligibility and application details, visit the INIS website. DO OTHER COUNTRIES ALLOW ASYLUM SEEKERS TO WORK? Yes. 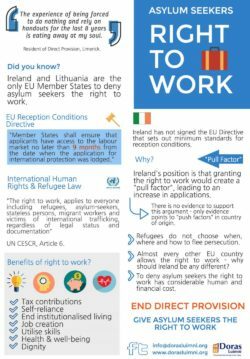 Until now, Ireland was one of only two EU member states to have a complete ban on employment for asylum seekers – the other country is Lithuania. Almost all EU member states (26 EU member states) allow asylum seekers to work after a number of months, ranging from almost immediate access to the labour market up to a 12 month waiting period. The EU ‘Reception Conditions Directive’ sets out minimum standards of reception conditions for asylum applicants, including access to the labour market and vocational training no later than nine months after making their application. Ireland, UK and Denmark were the only EU member states to not have opted-in to the EU Reception Conditions Directive. Ireland had not previously opted in to the Directive because of the requirement to allow asylum seekers access to the labour market. Ireland’s position has long been that allowing asylum seekers the right to work would create a “pull factor”, whereby we would witness an increase in asylum applications due to the more favourable conditions. See below for relevant research studies on employment issues that counter this argument and advocate for access to the labour market as quickly as possible. Read full report here: The Refugee Surge in Europe: Economic Challenges (International Monetary Fund, January 2016). European research on the integration of refugees into the labour market recommends that asylum seekers and refugees should integrated into the labour market as soon as possible, with targeted strategies and supports. The research suggests that it takes 15 to 20 years for refugees to reach the same employment rate as native workers. Read full report and summary findings here: From Refugees to Workers. Mapping Labour-Market Integration Support Measures for Asylum Seekers and Refugees in EU Member States (Migration Policy Centre, 2016). Read full report here: Labour Market Integration of Refugees (EMPL, 2016). Read full report here: Refugees Work: A humanitarian investment that yields economic dividends (Philippe Legrain, May 2016).